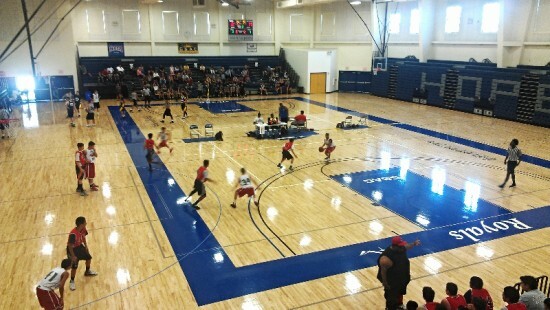 For the fifth consecutive year, Hope International University is hosting a High School Basketball Summer League. This year, 16 local high schools are participating in the league which runs from June 10- July 17. Players from 13 varsity teams, 13 junior varsity teams and 10 sophomore/freshmen teams compete each Tuesday and Thursday in HIU's Darling Pavilion. "Through our summer league, high school students get access to a safe, high quality, local arena where they can build their basketball skills by playing competitive games with teammates from a variety of school," reported HIU Men"s Basketball Assistant Coach, Jonathan Clasen. "Students receive outstanding instruction on the fundamentals of basketball from some of the best high school coaches in the area. Most students are excited to play on a college campus with the potential to be seen by some college coaches," Clasen continued. In addition to competing against one another, high school league players become familiarized with HIU's campus and interact with HIU coaches and students. Kevin Garcia, Head Sophomore Coach for Sonora High in La Habra, said, "Having the kids play on a college-sized court helps their conditioning and also encourages their aspirations to play basketball in college and potentially afterwards as well." This annual event is a great opportunity for HIU to serve and connect with local high school athletes and their families. "I always enjoying coming to watch games at Hope. HIU's facilities are always clean and very accommodating, and I appreciate the good officiating," said Kim Amaral, whose son Chris has participated in the league for two years.